Tuesday July 3rd 1883 I sewed all day to finish Mothers dress and the weather was so very warm After supper I did some baking for tomorrow. Wednesday July 4th 1883 Mother Rob and Ott went to the valley to a celebration. The Whetstone and Carney families spent the day here. It came up a heavy rain just at night. John and Hatt did not go home. Lee went to the valley in the afternoon and did not get home tonight. 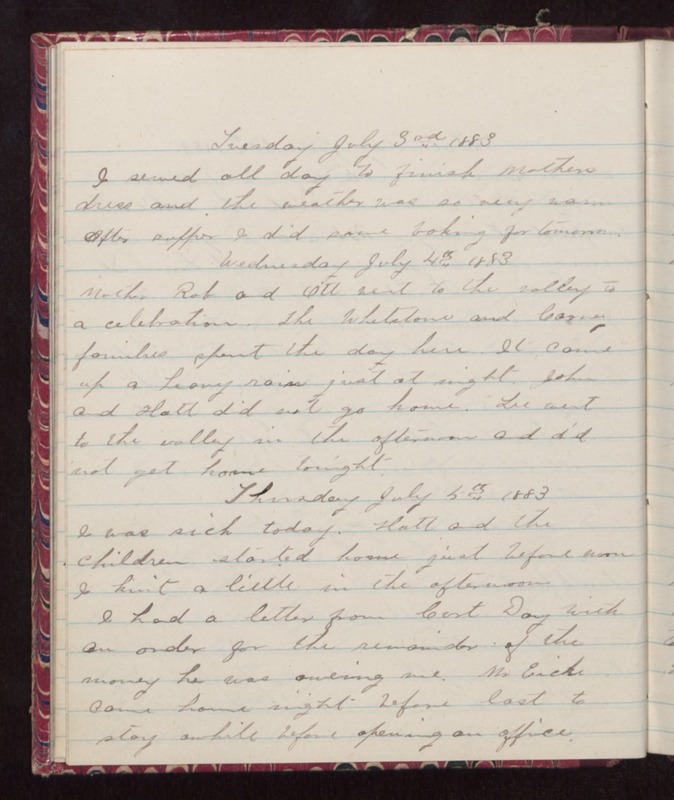 Thursday July 5th 1883 I was sick today. Hatt and the children started home just before noon I knit a little in the afternoon I had a letter from Curt Day with an order for the remainder of the money he was oweing me. Mr Eicke came home night before last to stay awhile before opening an office.